There was a time in my life when from spring to September, and sometimes on into November, I was busy earning my keep harvesting wild and domestic berries. First the strawberries in June and then the black raspberries, red raspberries, blueberries, and blackberries all had their turns slipping through my fingers and into my larder. As summer ripened, autumn’s red and gold raspberries swelled and finally the season crowned with sprays of elderberry and twines of bittersweet. We sold our fruit, jams, jellies, honey, garlic, and radishes, whatever we didn’t put up for the winter, at the local farmer’s market. During a good berry year, on picking days, I would pluck so many berries that when I closed my eyes the berries would continue to sway behind my eyelids summoning for me to select them, all night long. Sometimes past midnight, in a place between wake and sleep, the biggest berry that I had ever seen would appear, hanging just out of reach. I stretched through scratchy briars, stinging nettles and ragged thorns to obtain it. I grasped endlessly but never held in my hands that ever elusive, perfect berry. When waking up on those mornings I often felt like I had picked berries from the beginning of time through all of eternity. That was why I laughed out loud when I read Robert Frost’s poem, After Apple Picking, and I came upon these lines. Yes, I had indeed desired a great berry harvest. The longing was first seeded in me when I was a child in the Appalachian hills of Southeastern Ohio. Grandma and Grandpa took my brother and sister and I to the meadows surrounding their home to fill our baskets with plump berries for Grandmother to bake into cobbler. There was a great sense of accomplishment in this ritual. 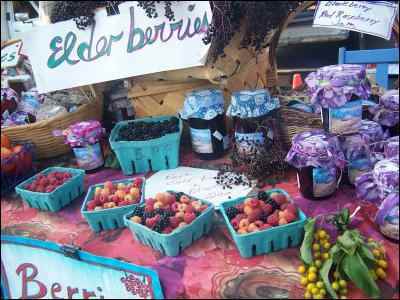 Our favorite was the native, wild, black raspberry, which according to Grandma could not be compared with any other. I have since learned that this sweet purple berry is indigenous only to North America. Lucky us. Recently I was conversing with Grandfather, now 97. He reminisced that in his berry bramble days he couldn’t stop picking until his pails were full. This made me smile. Perhaps the urge to forage the bramble is something that I inherited. I told Grandpa that I have always been the same way. We laughed and complimented each other that we have good old-fashioned bramble-blood coursing through our veins. In those childhood days our mother would take us to the local berry farms that hosted “u-picks.” The drive lead us past homesteads, woods, and meadows until finally, at the farm, they handed out pails and pointed us in a direction to pick from in the vast field of bushes. I liked the feel of the sunshine on my head and hearing the berries go ding and ping as they hit the insides of the metal pails. There would be a certain change of mood in me when the berries stopped pinging and began thudding, landing on each other and filling up the insides of the pails. It made me feel rich. When I was eleven my family moved and we settled in the foothills of the Ozarks in Missouri. The meadows adjoining our homestead hosted patches of wild brambles, which in the summers became laden with fruit. As a teenager my berry-bramble-blood proved true and I braved the chiggers, snakes, and the notorious Missouri ticks to claim those berries as my own. I had also learned to never take a person who was not endowed with bramble-blood to the patch with me if I actually wanted to pick berries. Just as I would get started picking, a person with DNA not coded for brambling would start complaining. They seemed to think that we were going for a visit with the berry bushes, taking a little walk around them or something. They did not get the adrenalin rush to sustain them that I got when I witnessed berries needing to be picked. They itched, were plagued by mosquitoes, nettles, chiggers, and ticks. Or they came totally unprepared, ran out of water, got hungry and/or had to go to the bathroom. Brambling just wasn’t in their blood. A few people have just up and left me in berry patches. If they needed to take a leak, there were all kinds of bushes to hide behind out there in the berry path. They could have just scratched if they had an itch it wouldn’t have bothered me any. How could they grumble about being hungry when berries were ripening in front of them? Thirsty? Berries have a lot of juice in them. Seemed to me that a person had just about everything that a person needs in the midst of a ripe berry patch. One time, I exasperated a bramble companion when I would/could not stop plucking the ripe berries that summoned to me. She took off in the car and left me stranded in the patch, alone. Well, I guess I might have put her up to it, a wee bit. I told her to go ahead and leave; at least then I could pick berries without her being an extra big thorn in my side! So off she went. I didn’t mind, I had bramble-scratch-fever. Happy as a queen, I filled my vessels for hours with the black glistening jewels that I kept finding. Finally I walked home, laden like a camel, my trove of fruit piled in dangling pails up and down my arms, swinging from my shoulders and propped atop my head. I held my face up and let the air cool my brow and I thought, Grandpa and Grandma would be proud, I had the bounty! Brambling is either in your blood or it isn’t. Eventually, I married a like-minded fellow and we settled down on our little acres and planted trees, perennials, bushes, and vines. Finally, I had enough berries. Berries to pick, berries to sell, berries to preserve, and on hot days I sometimes even got, can you imagine, more than my fill of berries. Was it when picking became my job that I started to attribute the kinks in my neck, cramps in my side and the ache in my back to the brambles? Or is it all related to time and age? I am not sure. I did decide that I should have been born Amish so that my whole tribe would help me pick all our berries and process them. I learned not to pick berries at the heat of the day if I could help it. The dreaded Japanese beetles are the most active in the sun and the scratchiest if they get on your skin and the clingiest if in your hair. I could not help picking all day, though, when market was next morning and the berries needed to be ready to go before sun-up. After five hours of picking blackberries during a July heat I have seen black snakes hanging from the bramble branches and I cannot tell you if they were really there because I was in a heat-induced hypnotic trance. One night, in the midst of a great berry harvest, I dreamed that I was in a berry patch, but there was no labor involved on my part. Instead, each berry branch was being handed to me by an invisible hand, which held a white ceramic plate with a fully loaded berry bramble lying across it. Ah! How nice! Answering now, to the name of Grandma (among others), I find myself steering towards thoughts of hosting “u-pick” mornings on our berry-full stead. This would give me a little reprieve and a feeling of having come full circle with my life-long, love affair with the berry brambles. Brambling my way through the years I came upon a berry myth that intrigued me. Alongside the road a sign read, Bumbleberry Inn. Was this a berry that I had overlooked? Crossing the threshold of the ivy covered tavern I met the innkeeper who wove a story about how the bumbleberry can be gathered only during the dark of the moon. He would not share the true identity of the mysterious berry in his bumbleberry pies. One day, much later, I was looking through antique cookbooks and discovered recipes for Bumbleberry desserts and they were combinations of berries with rhubarb. So, a bumbleberry creation was a mixture of berries and rhubarb, but why bumbleberry, like bumblebee and not honeyberry, like honeybee? I kept researching and inquiring, but it seemed that nobody knew the answer to my bumbleberry queries. It was in the most natural way that the answer came. 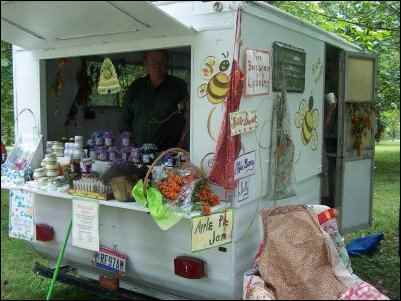 My husband, Jim and I were selling our produce and flowers at the farm market when a bumblebee decided to visit us. We watched as the bee wandered from flower to flower. Jim, a beekeeper, remarked that the honeybee is focused in her search for nectar and will return to the same source until she has expired it. Not so the bumblebee. The bumblebee will saunter about, bumbling into and visiting with this flower and that one. My husband was sharing this with me when the light bulb went off in my head. Of course, a recipe using a blend of fruit was named bumbleberry because of the bumblebee’s habit of mixing flowers. A bumblebee visits a variety of flowers so a bumbleberry recipe contains a mixture of fruits. In my acquaintance with an array of berries, I have a lot in common with the bumbleberry recipes. The strawberries were always welcome, coming early. The raspberries seemed so soft after the strawberries and then the blackberries seemed so huge. There are books filling pages with explanations about how to grow all the varieties of berries. Truly though, what is there to raising a bramble? On the bank of almost any un-mown roadside, and at every forest edge there they will be, sprawling. According to David Attenborough in his book, The Private Life of Plants, the stems of these little rascals can grow up to 2-3 inches in just one day. Brambles have a very strong life force. They make their way around the world by their suckers which spread under, over, and through just about anything. A gardener keeps the rambling bramble in check, forcing the base of the plant down to a narrow width and trimming out any old dead canes, keeping the bushes productive and neat and also getting the upper hand at keeping diseases at bay. The domestic bushes have a lot going for them. They can be kept in straight lines and some even come thorn-less. I have to admit, though, the tame bushes don’t quite get my blood flowing like the wild brambling berries do. I plan to take time through my life harvesting the undomesticated bushes every now and again, just to enjoy the free gifts of nature and to keep old fashioned bramble-blood alive and flowing.